After Picard has been taken over by the cloud entity he orders a course change to 925 mark 37, no wonder the crew get suspicious of Picard as the episode “DataLore,” clearly states that any heading can only be 360 degrees, like a circle… Shouldn’t someone have relieved him right then and there? This episode brings up an interesting issue and philosophical debate. 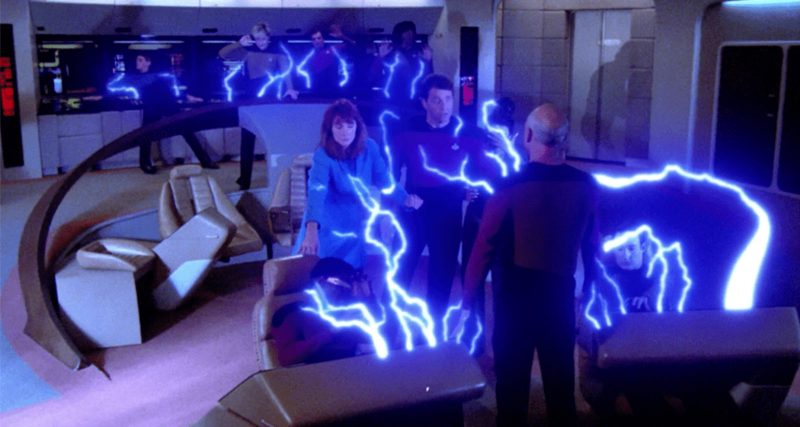 After the Entity beams out as energy only with Picard, the crew scramble to figure out a way to save their beloved Captain. Eventually, Picard is reconstructed from his transporter pattern that had been saved in the transporters system and he seemed no worse for the wear… Why then when someone dies on an away mission do they not do the same thing using the pattern recorded of that dead crew member before they beamed out to bring them back to life? Makes you think, doesn’t it? 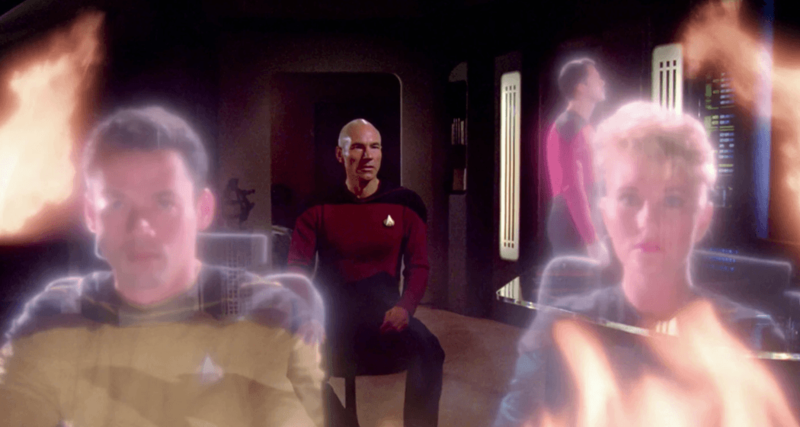 When Riker asks Picard to beam down he is very careful not to mention the reason why, which is because of Wesley. Later on, Picard also comments that he wants to inform Dr Crusher himself and discuss the situation personally with her. Yet, when he beams back to the ship, Dr Crusher intercepts Picard asking him what he intends to do about her son. She says she read about the situation in the away team’s mission report. What away team mission report? The away team is still on the surface and add to that the fact Picard was clear he wanted to talk to Crusher personally, does it seem logical that someone would have filed this report before the mission was over and in violation of Picard’s orders? Question; With the issue of the Prime Directive in this episode, why doesn’t Picard just pull the same hat trick that he did in the episode “Code of Honor?” Riker had already taken the needle they were going to inject Wesley with. So they could have analyzed the poison like in “Code of Honor,” and after Wesley dies they could just beam him up, warp away resuscitate him and all would be well! Answer; Using the same trick wouldn’t be exciting to the audience! An establishing shot at the beginning of this episode shows crew members basically at attention with their hands behind their back, yet in the following shot, their hands are comfortably at their sides! When Picard abandoned the Stargazer why didn’t he set the auto-destruct? To allow a ship to float through space to be picked up by anyone passing by is not only foolish but negligent… In the episode “11001001”, Picard and Riker set the auto-destruct on the Enterprise simply because it might have fallen into enemy hands… For that matter, why didn’t Starfleet send a ship to collect the Stargazer and tow her back to a starbase for repairs? There are a lot of unanswered questions here, no wonder Picard was court-martialled! When Riker finds out Picard has beamed over to the Stargazer why didn’t he snag her right off the bat with a tractor beam? Instead, he allows it to fly off and get into a position to attack the Enterprise. When Data comes up with a defence to the Picard manoeuvre he says that a vessel in that manoeuvre might appear to disappear. Data a ship doing the Picard manoeuvre doesn’t appear to disappear, it appears as though it’s in 2 places at once! I guess he forgot the briefing Picard gave in the conference lounge earlier in the episode! First off I have to ask, is there really a crewman sitting somewhere on the ship monitoring the turbolift system? 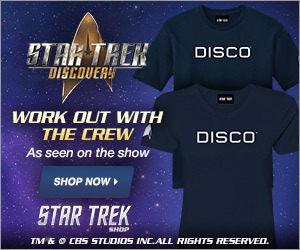 Talk about the most boring job in Starfleet. Speaking of the animal things, when returned to the ship Picard asks Data for a report and instead of giving Picard the information he ordered, Data sidesteps the question. 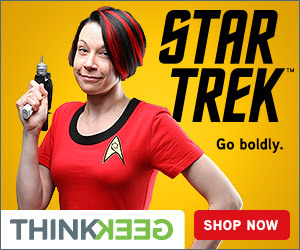 Does THIS seem like reasonable Starfleet Officer behaviour? Besides that, the fact that in the Episode, “Clues,” we find out Data MUST follow any order Picard gives, makes this scene completely unbelievable. When Wyatt beams aboard the Enterprise he gives Troi a rose, one with the ability to sense emotions and change its colours to match the mood of the person who’s holding it. It’s a very smooth gift on Wyatt’s part! 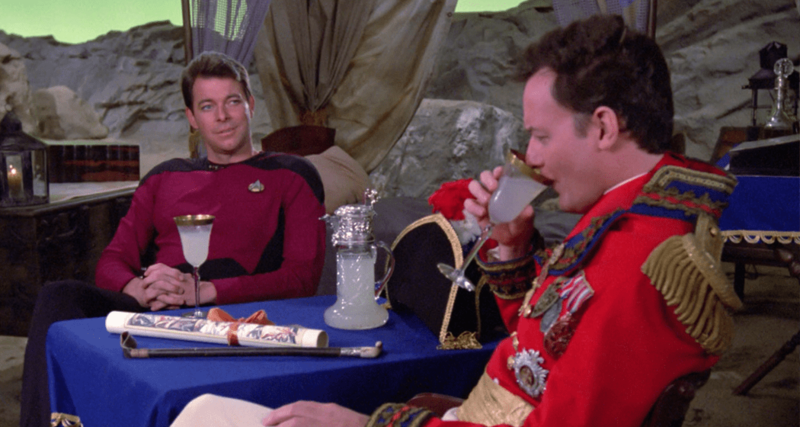 However, the problem here is that when Troi is given the rose it goes icy white which is not a good reflection on the person he’s about to marry. And to add insult to injury, the rose stays white until a conversation later on between Troi and her mother. Even though while holding it and speaking to Wyatt Troi gets visibly upset and embarrassed. Was Troi just faking those emotions for the sake of creating drama? Why exactly does Picard let the plague ship get into transporter range of the Planet? Shouldn’t his duty to protect Federation Worlds have led him to take the Enterprise out of orbit and intercept the doomed vessel BEFORE it can beam down and infect the entire planet with the Plague? At the Beginning of the episode, we find out the Enterprise was originally scheduled to Visit the planet for shore leave. Yet, at the end of the episode, the Enterprise leaves orbit on it’s way to its next destination. What about everyone’s Vacation?